Like Merchant Ships: What's Better Than Dirty Carpet? What's Better Than Dirty Carpet? Our 2 bedrooms have carpet--stained, impossible-to-steam-it-yourself Berber. Twice, in a fit of pre-party panic, I called the professionals. That's $200 I wish I had back. This weekend, I decided I was ready to live with nothing or figure out an alternative. Turns out, there was something decent all along. Our 1950's kit home must have come with finished sheets of plywood, just as our walls and ceilings are wood instead of plaster or drywall. The seams were sanded and even; the screws, countersunk and filled. Damage remains on the edges, with tack strips and paint drips. I can either paint a border around the edge of the room, leaving the wood stain intact--or roll a coat of white floor paint over the whole thing. I would paint the entire floor. It will be easier, I would think. Paint a border first. Live with it a few weeks and then decide whether or not to paint the entire floor. Who knows, you may love the border and save yourself a ton of time. I got rid of my carpet a few years ago. A local dealer was running a special on laminate flooring for $1/sq. foot. I bought enough to finish EVERY room in my house. Love, love, love it. I got rid of the carpet in my home many many years ago. With a day care full of kids, 4 grand children, 5 dogs, and a messy husband carpet was not working. We too went with a laminet floor. So easy to take care of. It is 6 years later and it still looks new. Would not go back to carpet for anything. Border. I agree to try that first. I painted a dining room and hallway in our last "flip" house. The paint held up better than I expected, even in the hallway. That was before kids and only two of us walking on it most of the time though. I'd say border. With the kids I think an entire painted floor would be too delicate. nice surprise after the carpet! I too agree that you should try the border first. The wood stain looks pretty nice to me! I love painted floors so I say paint the whole thing. Floor enamels are durable and if you want to, you can paint a "rug" on it. I would paint it. White would work as would other colors (there's a ton of pictures like that on design blogs). As for having it with kids, it might show stuff, but all it would take is a little brush to touch it up and it would look as good as new. You can't do that with any other floor. As for me, next time I'm faced with a flooring problem, I'm going to go with FLOR. I'm in love with their concept. Depending on exact details, I might choose option "c" and try sanding and refinishing a border. I'm personally all about the look of stained wood, and if you're going to have a border anyway . . . I'd try just fixing the area that needed fixing and see what I thought. Then again, I'm just going to kick back while you do the actual work. :>) Good luck! Can't wait to see what you decide! I'd start with a border, and then give it a week or so...if you don't like it, I'd then do floor paint. Maybe you could just roll on a dark stain? You might have to sand the floor first if there is still a lot of finish on it. You can rent a floor sander. I say border. That wood floor is too pretty to cover up. And you'll have a hard time keeping a white floor looking clean. Border!!!! I am with the others that say, if you don't like it, you can do something else, but it already looks nice! I'll join the folks who vote for a border, reserving the option to paint the whole floor later. I think it would look interesting and turn what had been a negative into a feature. BORDER! The stained wood will hide the kid dirt for much longer than white paint. Love it! What a great discovery. In our first house, the previous owners had let their dogs run wild on the carpet. We didn't notice until we moved in during a heat wave. Ugh! Hubs said concrete subfloor (standard in CA) was better than stinky carpet. It was much better. Thanks for inspiring us to think outside the box! I say sand it and try to repair it. My mother in law ripped up carpet and had nearly the same problem....they sanded it and finished it the same as the center of the room. Personally, I think it looks great. Border! Wood floors are amazing, and really easy to keep clean even with kids around. Also, enough paint for a border is cheaper than paint for the whole floor. I would think long and hard about it before painting the floor. It may not wear well and traffic patterns will start showing. Our stairs were painted and they are wearing through. I am thinking about repainting them since they're already painted. Had thought white, but then I realized that would show dirt well. Now I'm not sure. I love the look of wood. I like Melody and Lenetta's idea. Maybe you could try one thing in one room and see how you like it before doing any of the rest? What a find!! I love white painted floors but admit that I regret doing it (one room in my house). I don't know how the Europeans manage to keep that look so pristine (maybe a no shoes inside policy?) but my white floor is impossible to keep clean and looks awful most of the time. If you paint it, I would probably consider another color. I think the border idea is a good one too. Please leave the floors natural wood! If you must, go with a dark border. I would start with a border. Maybe you could even add something "fancy" by stenciling a faux "inlay" of sorts! Lucky you...our carpet is really bad as well. But someone "remodeled" our home before we bought it and gutted ALL the hardwood floors and left us with ugly sub-floor. Ah well...we're saving our pennies...and nickels..for new carpet. We did the same thing, and I would almost guaruntee that the floor needs refinishing: it will start to spot very, very quickly if it gets even a little bit wet. Plus, the refinishing will make the damage on the edges completely disappear. It's a pain, but it's so, so, so worth it. we're in love with our floors now. I agree with trying a border first, then see what you think. . . I would paint a border. A white floor is going to show every ding and scrape that it gets, whereas a scrape on a wood floor adds character. Don't paint it! Its hard for me to see in such a small picture how bad it is. The previous owners of our house put up small extra wooden boarder around to cover the carpet nails and it looks fine. The only place that you can see the marks is in the doorways and in the hallway. We put a rug in the hallway and the doorways are not super noticeable. Staining it might also work. There is also a random nail in our living room floor so I placed an ottoman over it. it's not a plank or traditional wood floor. It is made of a high grade plywood that is stained brown, and it goes right next to the hallway which is a warm, lighter hardwood floor. So the woods will not match if I leave the existing floor as it is. If these were real wood floors I would refinish without question. Otherwise I don't think it's worth the trouble of staining/refinishing plywood. Don't paint it! Please!!!! Paint shows nicks and chips so badly, so quickly. We painted the trim in our house white in October, and I can't tell you how many nicks I've touched up since then. I can't imagine how bad it would be on the floor. Not sure if I'd do a border, though. I might have a professional in to figure out something else. Yeah I really would not at all ever paint it. I'd put a thicker baseboard in. It may become a type of ledge if it needs to be that thick but I really wouldn't paint it. I'm with the last comment. Add quarter-round or some other small trim piece. It might hide most of the the holes. And as for the paint, I'm guessing after you see the entire wood floor, they may become less significant and hardly noticeable. OOOOHHHH! Please, no paint! Well, paint a border if you must, but otherwise leave the floor to show it's natural beauty. The prep work to paint a floor is killer, then near to impossible to remove the paint should you want to in the future. The couple who lived here before us had the same thing happen. They took up old carpets and found out the floors are hardwood in all the bedrooms, the hallway, and living room. They did replace nice carpet in the living room but refinished the wood in the small dining room and just put a stain on the wood in the bedrooms. When we had our Colonial up for sale, we found out a lot of people are looking for nice, wood floors and were willing to pay for them (we did not have wood floors then). I guess it all depends on the look you want. I think painting the floors would brighten the room and create a "cottagey" look, if that's something that appeals to you. Don't know if that would go with your furniture, decor, bedding, etc. so it could just create a whole new problem to solve. Can't wait to see the results. Another vote for paint a border first and then see about the whole floor if you don't like it. The previous owners covered a perfectly wonderful hardwood floor in our Fargo farmhouse with carpet too. We ripped it up in Rich's office and LOVED it. Didn't need to do a thing to it. If that was real wood planks, I would advise you to sand and refinish. Since they are bedrooms and not high-traffic rooms like a kitchen or hallway, I definitely vote for painting the whole floor. You'll still notice the difference in wood tone between the floor and the hallway with just a painted border, and white floors bring so much light to a room. I live in Denmark so I can verify the previous commenter's remark about "Europeans" who have painted floors - yes, it's a no-shoe policy, but it's polite to take your shoes off no matter the type of flooring. Seriously - where have those shoes been? And then your baby is crawling around on the floor? FAIL. Plus it's comfier, cuts down on dirt and traffic, spares all forms of flooring extra wear and tear. Be hospitable and offer your guests house-shoes. (If you're crafty you can whip up simple slippers from fabric scraps and batting in no time, otherwise get some cheap China flats or sandals.) OK, rant over. If the rooms are children's rooms and you are worried about excessive dings and scratches (to a certain extent this can be charming) then you can put a rug down in the center of the room. The contrast between the rug and the white painted floor around the edges will make the room seem larger. I think wood is wood! Finish it as best you can and live with it for a bit! I could not LIVE without wood floors! We only have carpet in the bedrooms and with kids + rabbit ... wood floors are the way to go! I understand about a plywood "sub-floor" . 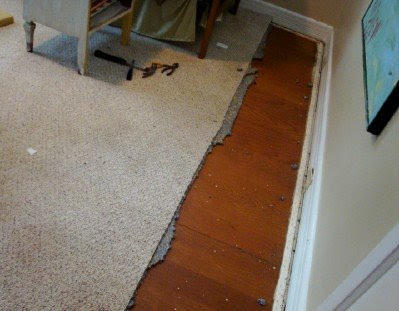 I think a border is a very practical and inexpensive way to deal with carpet tack scars. I am sure you will locate a good deal on a rug or flooring , especially since you are such a savvy shopper. In retrospect wood floors or laminate would have been a wiser choice. We had a Berber carpet prior to this one and it stained but did not wear out , it was pretty nasty looking when we removed it. Considering that its plywood, and not real wood flooring, I love the idea of painting white. Our house has light tile throughout and I love the look. Agree that a bedroom doesn't have the same issues with high traffic as a living room or kitchen. Plus I thought I remember reading that you already had a shoes-off policy because of the hardwood floors throughout the rest of your house. You can always put a rug down on area that is getting high use. Yup, I'd go for a border. How fun! The picture looks really great. Being it's plywood and not hardwood, I think white paint would look amazing. A border sounds like a lot of fun, too, though. With kids, a sweepable, washable floor is so practical and I love the look. I would do the border first. The wood in that photo looks great - I would paint as a last resort. I would be really curious to see what kind of border you would paint. You are so artistic that I could imagine you doing a very cute design. If you did decide to simply paint the floor, I would maybe go with something other than white. In our last house, the wood floors were painted a lovely green, which was very neutral and didn't show dirt too much. Can't wait to see what you end up doing! When we first moved into our home, our kitchen had this awful 1969 carpeting with blue and gold medallions all over it. The Labor Day weekend of 1999 we painted it. It was a plywood subfloor, I don't think it looked as nice as yours because ours was unfinished. The plywood in your photo doesn't look that bad. We painted ours cream, then, here's the putzy part, we laid down tape and faux painted large "tiles". At the same time we had painted our lower kitchen cabinets kind of a greenish gray. It served as a good in-between for us for maybe 4 or 5 years until we put in a laminate floor and repainted all the cabinets again. I think leaving most of the floor "natural" will be easiest, and your time is an important consideration. I don't think taping will be that bad for you. We used a finish sealant, like 2 or 3 coats on top of the paint. Still, the paint got worn in parts. I can't remember now if ours was plywood or particle board. The seams showed in our floor. That's one thing that is a little annoying, and I think doing just a border will minimize the look of the seams. I look forward to your decision and more photos! Oh lucky you! I'm dying to yank up our old, stained carpet, but the concrete foundation is underneath... I'll have to wait until we have the cash to pay for alternate flooring. Paint the border before committing to painting the whole floor. I think you'll enjoy the warmth of the finished wood, and a nice border will simply add some interest. If you paint a border it will make the room look smaller, I would paint it all black... but then every piece of white fuzz and paper whould show, maybe a dove gray that wouldn't show wear and tear? I'd try just pulling up the tack strips and leaving it alone (assuming the stain is underneath them). I pulled up 400 sf of carpet in the upstairs of my home some years ago to find wood floors that were just OK, dull and worn in spots and almost like new in others. I rented the sander from Home Depot and did the work myself. I gave it a few coats of polyurethane (no stain) and called it a day. It turned out pretty well considering I had never done anything like that before, and since the beds and rugs cover most of the floor, I don't notice any of the imperfections I thought would bug me. I had thought the nail holes from the tack strips would be a big issue, but they're hardly noticeable. It doesn't match the new hardwood flooring downstairs, but I like the character of the original floor. My vote is to do the minimum (like just get those strips and staples up, which is actually the worst part...) and live with it for a while - see if it grows on you. Since water damage means we are about to replace our floors, I'm going to have to live with subfloors for a couple of months until we save up for new flooring. Paint is what I'm choosing to do. It might wear here and there, but it will look better than what we have now for sure! I'm in the paint it camp. But would choose a different (ie darker) color than white. A few years ago we tore up our carpet - and tackled refinishing and staining the hardwood floors underneath. The house was built around the early 50s late 40s...looked like the floor had never been refinished - it took A LOT of work to get that floor looking great again but so worth it! I do like the idea of painted floors. I painted by boys' bedroom wood floor - white - a few years ago. I do have to tell you - make sure you put quite a few coats of polyurethane over the top of the paint. I asked the guy at the hardware store and he said that regular floor paint would hold up well without any polyurethane over it. I took his advice, and not even 6 months later the floor was a shambles. Now I have to re-do the entire thing. Make sure you don't make the same mistake. :) Polyurethane it! I'd rip up the carpet and just leave the floor as is. I wouldn't bother painting the border. I'd just consider a little shabby chic. ooooo paint the floor white... how gorgeous! It may be "just" plywood but if you think about it it's very similar to in construction to the veneer type of hardwood flooring sold today, that clicks together like laminate, and probably better quality than that which costs $5/sf and up (no one wanst to know the prices for SOLID hardwood flooring). Possibly consider scraping off the paint and filling the nailholes with colored wood putty and just living with it until you can refinish it at some later point. Since you have very little to loose, I'd paint the floor, because I love paint. Maybe stencil the edges or paint it two colors in a diamond pattern. If it doesn't work; laminate flooring is cheap and pretty easy to install. When we moved into our 1960s ranch we found green shag in the bathroom. Underneath was the original vinyl flooring in excellent condition except for the holes around the edges left from the tack strips. You know what? I never notice those holes and the floor will do just fine for several more years. P.S. Don't paint white. I think it would probably be lovely either way. Are these bedrooms the ones that the kids use? I don't know how you have the kids divided up- are the boys together, is Elise alone, or are there just two bedrooms total? I remember the furniture that you and Andrew painted with frogs and lizards, etc., and that was just darling. So were the old dining room chairs you painted, your current dining room table and chairs, and even the big piece of artwork you let Elise paint recently. If you painted the floor a dove gray and added some artisitc elements like you did on Andrew's furniture, I think it would just be tremendous. You seem to have a real talent for making things beautiful with paint! Shoot, I even loved the canteloupe picture you painted and hung outside on your old back porch/carport area! I truly think you could probably make them beautiful. I'll bet painted floors would make Elise's room look even more lovely and feminine, and ethereal, than it already is. Check out the Children's Pottery Barn catalog- they paint EVERYTHING and it always looks wonderful. Hurry and decide so we can see the results! I just went over to Pottery Barn's Children's website, and looked at the girls' rooms. They show a lot of beautiful looks with floors both painted and stained. It would be worth a look over there for some ideas! Since it's plywood I would paint it. I like the look of painted floors. I think the decision ultimately depends on the furniture in the room. If it is mainly wood coloured, I'd paint the floor. However, if the furniture is mainly painted and all along the same colour, I'd just paint a border and leave the floor. I will give you my experience painting our floor. I'm just going to preface this by saying that in our families, I'm the person that is called when there is painting to be done, so I do a lot of painting. Painting a floor nicely is very hard. I rarely drip, only rarely using tape and drop cloths... I dripped a lot with the floor... which seems odd! Also, the roller was nearly impossible to get a nice even and smooth coat. I bought a decent telescoping pole (for my HIGH ceilings) and a 'push pad' about 12" by 8". This gave me the best coats. I painted about 2 coats of the base colour paint. Very thin, dry time was about half of wall coverage. Yes, it was the wall paint and I simply used it on the floor. I sanded between each layer and dry dusted it each time as well. Then I did at least double the amount of coats of the floor varnish. I can't remember the name but something diamond finish. Again, very thin, sanding, etc. Then I waited 3 weeks before putting furniture on the floor. It was a royal disruption to us as we essentially had the four of us in a 700 sq. ft. home with 3 pets. BUT! The floor has held up amazing! It looks fantastic, there is basically no wear showing after 2 1/2 years. The total time was about 3.5 weeks from start to finish. I've never had such a difficult time painting and really really hated waiting for the floor to cure [to the point that I didn't wait the 4 weeks I was planning] but the result has been well worth the effort. My kitchen has a painted floor. I hate it. It's hard to get clean looking, it's slippery, and it looks like it's chipping where the feet of the stove sit. We had a floor like that! My husband sanded and polyurethaned it. If that's not an option - go for the border! I'd paint the entire floor white. White wood floors look clean and bright. White cars are known to show less dust and dirt than other colors (can you tell I married into a "car family"?). So, I'd assume flooring may be the same way. I'd start with a border. You can always paint the entire surface if you don't like it. I think you should paint the floor. It's a bedroom area, not so high traffic, and the paints are easy to clean. Just my two cents. What about taking up the tack strips and putting painted quarter round alongside your other baseboards? We did this in the last home we lived in with pleasant results. Also, I don't know if you read Morning Ramble, but they did their floors that way on purpose, with stained plywood. You can put several coats of polyurethane on top to make it more durable if you go that route. I would go with the border, absolutely. The floors really are beautiful in their natural-looking wood state...why would you cover that over with paint? P.S. Congratulations on having the courage to lift up the old carpet! Nice find! please please please do NOT paint the whole floor. that is beautiful looking wood there!paint a border or (if it were me) smooth down the holes and let that be character. years before we owned our home, there was a fire in the living room. the sub floor, but not the wood floor, was replaced. now, i own a steam cleaner and long for the day we have saved enough money that the fix it money can go to wood floor and not some structural, electrical, etc. project. I agree with Lenetta, Melody and anyone else that said to repair the wood and perhaps stain the border a darker (or lighter) color. When we had paint drips on a floor we used a citrus oil cleaner and it helped the paint soften and come up, and it also helped to treat the wood. I believe the cleaner I used is Goo Gone. What a blessing to find such nice floors underneath your carpet. I am sorry, I don't have any thoughts on how to treat the carpet situation. I just wanted to tell you that I saw the write up about you in Parent & Child Magazine and was thrilled! Great job! Like Merchant Ships has been a blog favorite of mine for a while now. I was pleased to see you won a Mommy blogger award. Your blog has helped me beautify my simple home and after all isn't beauty about being simple? Keep up the great work! I think it would be more work to paint a border than to just paint the whole thing. So, my vote is to simply paint the whole thing. Surely it can be sealed with something so that the paint doesn't chip and look bad. As someone who has done this in two different house, and since the floor looks so nice what I can see of it anyway, I would try to touch up the edges if possible, not painting a border. Just my two cents. Having painted a wooden subfloor, even with great prep work, I won't EVER do it again. Ugh Perpetual Chipping, even with throw rugs. I would be inclined to invest in hardwood flooring, it is always a resale plus. I have never regretted any money spent on wood flooring. Saw a Kenneth Brown room once, where he purposely laid plywood for the floor, and did a modern countersunk nail-head as a design feature at every corner juxtaposition. It was beautiful. Your solution will be great! p.s. intriguing piece of art on the walls...more Elise? I'm getting confused with all these comments. This isn't a "subfloor" -- correct? It's a finished wood floor that was covered with carpet -- correct? Speaking of floors, just today I was looking at our hardwood floors and can see the nail marks from the tacking strip we pulled up. It's unnoticeable. I haven't thought about them since we pulled it up eight years ago. And still today, I don't think you'll notice them. You'll have furniture in there. It's not like the floor is the only thing you're going to look at. I'd come up with a border. Paint can be a nightmare to care for. My parents 1930's home has beautiful grey stained wood floor, but caring for it is so difficult, and the cost to restain... don't ask! I think you are so lucky to have found that treasure underneath! My carpet is so disgustingly dirty! Between the kids, the cats, and hubby and his friends coming in from the garage, our cream carpet is actually brown and black spotted. But it was built in the 1980's, so there is nothing worth seeing underneath. S, that's the rub. It's not a fully finished wood floor--but it's not the typical raw particleboard subfloor, either. It's a higher grade plywood that has been fitted together and stained. The question is, is it worth refinishing/reworking that kind of floor so that it flows with my existing hardwood floors? And if not, what then? I have looked all over town this week for a matching prefinished or Pergo-style floor with no success. Anyway, I'll be back with a helpful roundup of options later this week. I vote for what Williams Arena wrote - paint a border first and then wait and see. Meredith, what about another option -- putting an edge of wood parquet-style tile around the edge of the room, where you would have painted a border? And if you really, really want a painted border instead, I'd probably use a stencil, or paint with a variety of wood stains, rather than paint. It will help the colors blend in together better, and give you more options if you change your mind in the future. Colonial floors did this a lot...a classy look, I think. I'm for the border first. Maybe a checker pattern? I think the border sounds nice. We switched to wood floors after many expensive carpet cleaning treatments. The wood floors look so much prettier.